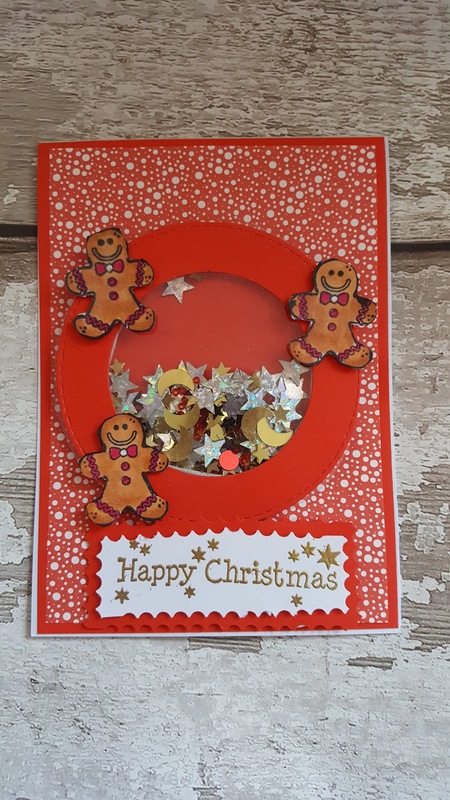 Hi everyone I enjoyed making this Christmas shaker card. I used a white A6 card as my base card. I matted the Base card with a piece of red and white spotty paper from a paper pad. I used my stitched circle dies to make the shaker element, I used shiny gold,silver and black stars in my shaker, I also used some tiny red beads. I stamped and coloured 3 gingerbread men and then fussy cut them. I positioned them on to my shaker window. 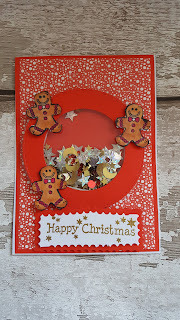 I stamped the happy Christmas sentiment with my Versamark ink and heat embossed it using wow gold embossing powder. I cut around the sentiment using my fancy edged scissors, I matted this on to a piece of red card and stuck it at the bottom of the card, my card was then finished. Why not take a look at my process video on you tube.